Dental implants are metal posts that are surgically screwed into jaw bone to support either one or many artificial teeth. +Why types of dental implants treatments are available? Dentures secured on implants are generally classed into two categories: screw-retained implants, and removable dentures on implants. +Am I too old for dental implants? Many people over ninety years of age have had implants placed without any trouble at all. After the procedure, most express that they wish that they had not waited so long, disappointed that they didn't have the implants placed earlier in life. +Are dental implants really necessary? Yes! Following a symposium held at McGill University in 2002, leading dental researchers determined that the minimum treatment for anyone missing all of their lower teeth is a denture on two implants. This means that a denture alone can no longer be reasonably considered as acceptable treatment for anyone missing all of their teeth. Dental implant placement is surprisingly comfortable when compared to other dental procedures. Many patients who have benefited from getting dental implants say that their level of discomfort was minimal because the implant surgery only took about ten minutes per implant to be completed. +What are dentures with screw-retained dental implants? This type of dental implant treatment involves a much more fixed denture prosthetic. The denture is screwed in to the implants by the dentist and is not removable by anyone other than the dentist. This treatment is as close to getting teeth back as possible because the denture cannot come out during day to day activities. The drawbacks to this treatment are that there are many patients who complain that having a fixed appliance screwed in to their jaw is uncomfortable. Having this type of denture restoration requires meticulous dental hygiene practices because of the possibility that food will get under the screwed in denture leading to decay and potentially to the implants failing and needing to be replaced. Finally, this treatment is the most costly dental implant treatment available, generally costing as much as $30,000 per jaw because of the added work needed by the dentist as well as increased lab fees. +What are removable dentures on dental implants? 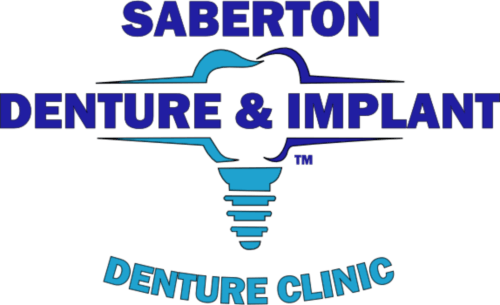 Because of the high cost and high maintenance required with screw retained dental implants, Saberton Denture & Implant's most popular implant treatment is for removable dentures on dental implants. What is the difference between removable dental implants and secrew-retained dental implants? The denture in this treatment snaps on the dental implant and is removable by the patient, similarly to a regular denture, but much more secure. The advantage of this dental implant treatment is that it is far easier to clean the denture, whereby the denture is removed from the mouth and brushed in the sink or soaked in a cleansing solution. The oral cavity can easily be brushed once the denture is removed, greatly reducing any chance of decay or disease around the implants. 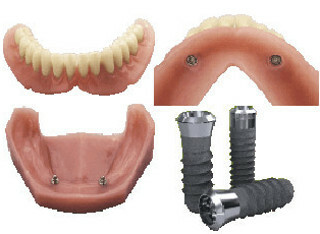 This treatment is also more affordable; because of how many of these implant retained dentures we work with, our partnered surgeons are able to offer straightforward services and fees, having provided implant treatments from as low as $6,870 for two implants including surgery and all necessary implant parts and denture. +What are mini dental implants? It’s debatable whether mini implants can even be referred to as dental implants. This treatment is seen as a lower cost alternative to the traditional dental implant whereby mini implants, as the name suggests, are much smaller in size. Mini implants generally fail at a rate of up to 30%. Because of this high failure rate, Saberton Denture & Implant generally recommends the time-tested traditional dental implant as a solution. While mini implants have their place in helping dentures stay in place, we find that regular dental implants are our preferred choice, simply because of how well they work. And when it comes to surgical procedures, Saberton Denture & Implant feels that it’s always better to work with treatment plans that offer the best outcome. 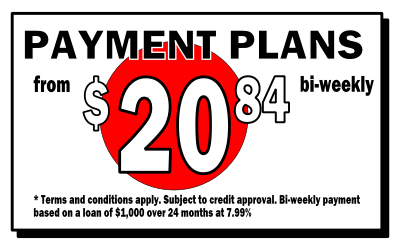 While two new dental implants and a new denture costs about $7,000, the implants are guaranteed for life and the denture usually lasts at least ten years. 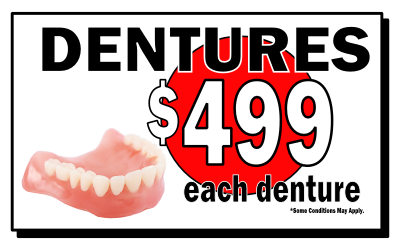 This means that the actual cost of getting a denture on two implants is less than $2/day. Comparing this amount to the cost of having to use a couple tubes of denture adhesive every week, implants actually work out to be the more affordable option.